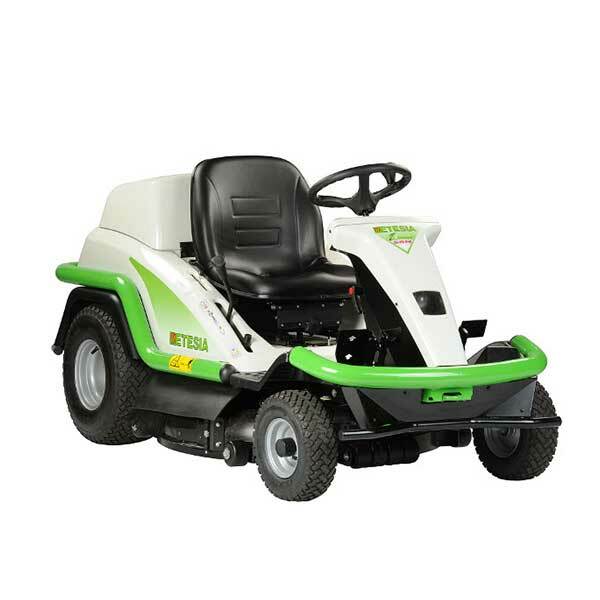 The Etesia Attila SKD has wheels with an agrarian profile, and also a very low centre of gravity and optimised weight distribution (33% to the front, 67% to the rear), for easy driveability and stability on banking. The differential lock with foot control is very practical in use, and will allow you to retain control while mowing on slopes, even if a drive wheel loses adherence. Profiled mowing deck, and reversible swing tip blades (85 cm cutting width). The system allows mowing in difficult conditions. 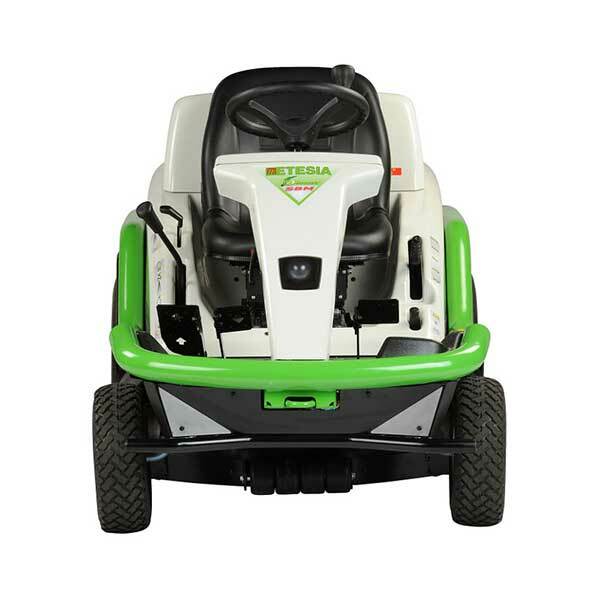 Thanks to the optional dual wheels, the Etesia Attila SKD passes where the others trespass. This option enables you to climb very steep slopes under difficult conditions (wet grass, sand or mud) without creating more damage because of immense ruts. The dual wheels allow a better distribution of the weight and an optimal transmission of the power. Hand control for drive transmission, from 0 to 10 km/h: adapt your speed precisely to the terrain (slopes, obstacles etc.) or to the height of the grass for closely controlled mowing. A mower that can be adapted to your build. The seat has armrests and moves forward and back on a rail for adjustment, the seat suspension firmness is adjustable, as is the steering wheel tilt. The steering system is responsive, smooth and requires no effort. The wheel has a knob for dynamic and enjoyable driving, especially on rougher terrain or with obstacles. All the controls are accessible from the driver’s seat for maximum comfort and greater safety. The parking brake is controlled with a pedal and is very easy to apply and release. The pedal position is designed to be extremely ergonomic. Tank filling is clean and safe – a retention duct drains away extra fuel in the event of a spill. Nothing needs to be removed to change the engine oil, thanks to a valve fitted on the engine. The valve is extended by a pipe that drains the oil away to the rear of the machine from where it can be collected easily. No removal for changing the oil and replacing the drive transmission filter, with easy access to the rear of the machine. Reinforced hydrostatic transmission with Outils WOLF specifications that draw on automotive features: torque higher than market standards, smoother movement and a longer life. Cutting decks designed specially to withstand different mowing conditions for a long period: Mastershock (with steel reinforcements). Reversible blade flails. The system allows mowing in difficult conditions. Change from the high grass mowing or brushcutting to the mulching… You can fit the mulching cutting deck of Biocut SKM to Atilla SKD. The change is quick and requires no tool. The wheels may also be replaced. Thanks the fastener which is on the back of the machine and the progressive foot-throttle hydrostatic transmission of last generation, it will be very easy for you to pull a trailer without jolts. Don’t blow you out any more to clear of snow. With its snowblade, the Attila SKD is the ideal tool to clear of snow any access. Thanks to its compact size, it enables you to thread in places which are inaccessible to other machines.